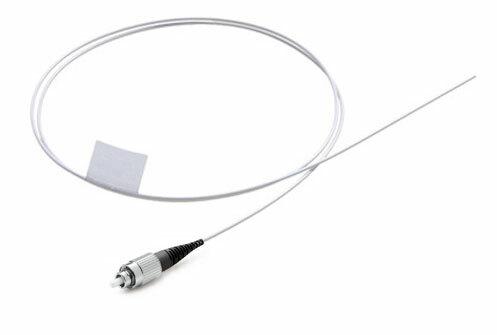 Singlmode OS1 fiber optic pigtails, un-buffered, have an optical connector pre-installed on one end along with a period of exposed fiber at the other end. LC Fiber Optic Pigtails, Singlemode OS1, 900um, up to 10 meters in length. LC/APC Fiber Optic Pigtails, Singlemode OS1, 900um, up to 10 meters in length. SC Fiber Optic Pigtails, Singlemode OS1, 900um, up to 10 meters in length. SC/APC Fiber Optic Pigtails, Singlemode OS1, 900um, up to 10 meters in length. FC Fiber Optic Pigtails, Singlemode OS1, 900um, up to 10 meters in length. FC/APC Fiber Optic Pigtails, Singlemode OS1, 900um, up to 10 meters in length. ST Fiber Optic Pigtails, Singlemode OS1, 900um, up to 10 meters in length.